Ste. Marie waiting at her new dock for a mast raising. Last fall Wayne and I bought a another boat. When you live on the water you can't have too many boats. Her name is Ste. Marie and she's a nineteen foot O'Day Mariner daysailer. New brow log outside the larger one. Wayne became interested in sailing quite a few years ago. His first attempt was a 32" radio controlled Nirvana II. She still graces the corner of our loft bedroom. Next came a Laser sailboat. Designed for racing, it was a hard boat to start his learning curve. She's now for sale because Ste. Marie is a better boat for the two of us to use to learn how sail. New walkway and brow log on the right. To get ready, we needed a new boat dock at the cabin. John, as usual, came to the rescue. He used our wood storage float as the base, added an additional floating support log and two bracing brow logs before decking in a walkway and boat dock with a Bull Rail for secure tying. The new dock at the back of the wood storage float. As soon as the rainy season ends, we'll seal the wood with opaque redwood coloured stain to match the rest of our decking. That will preserve the wood for many years to come. From our float cabin home we don't get to see sunsets because of the surrounding trees and mountains, but out in the middle of the lake we get some pretty spectacular ones. Wayne and I were out sailing in our new boat on Powell Lake in the large open section of the lake that we call the "North Sea," we could see this this sundog bracketing the setting sun. Along the edge the cedar float that provides a transition between my float cabin and shore, Sweet Gale (Myrica gale) clusters in profusion. It’s a common plant seen growing on old logs and booms here on Powell Lake. It can also be found in wetlands at low elevations from the Pacific Northwest to Alaska. If you pick Sweet Gale, you will find that it has a very pleasant smell. Dried, it would be a nice addition to a potpourri. Sweet Gale is a deciduous perennial shrub that grows to about 1.5 metres in the best of conditions. Mine are about half that size. The leaves are dull green and whitish underneath. The tips tend to be slightly toothed with notches. In contrast to the leaves, the stems are dark red. Male and female flowers are found in catkins on separate plants. The male catkins can be distinguished because they are longer than the female ones. Catkins appear in the spring before the leaves emerge. The seeds form into brown cone-like spikes and remain on the plant through the winter. Living in a floating lake environment, it’s nice to have natural green plants growing on the brown logs floating around my home. They tend themselves and survive from year to year, providing lots of visual enjoyment. From late fall through early spring our float cabin requires heat. 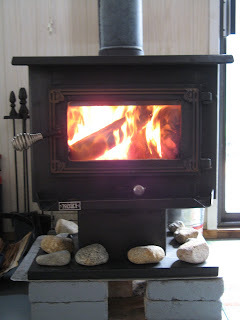 For that, we use our Kozi woodstove. We love it! We call it the heart of our little home. But what we don't love is smoke blowback. The way our cabin's chimney is installed it allows wind coming from the south and east to block the flow of smoke, causing it to back up into the cabin. It's not only uncomfortable, but dangerous because it contains small suspended particulate matter, carbon monoxide, and other gases depending on what is being burned. In 2008 we installed a rotating chimney cap that solved the problem without having to redo the chimney pipe. At least until this fall, seven years later. We clean our chimney pipe inside and out several times each burning season. On the last inspection, we noticed the metal cap was deteriorating. Here's what time, weather, and creosote did to our previous cap. Not good, but not bad for seven years of heavy use. You can see that the fin completely departed in the last heavy wind storm. Fortunately, our regular cleaning schedule caught the problem. The cap has a fin at the back that forces the protective portion of the cap to vane into the wind. The back portion of the chimney cap is open to allow the smoke to flow away from pipe and keep downdrafts from occurring. Except when we light a fire in a light of breezes that isn't strong enough to move the cap, it works perfectly for us. When that happens, we move the cap manually with a long pole to prevent initial blowback when the fire is started. Once the flew is hot, the natural draw takes over. Here's a detailed article from Mother Earth News that provides a lot of installation and safety information. Last summer I discovered an unusual growth on the steel cables used to anchor our float cabin to shore. I am not 100% sure about my identification, but I think it is correct. If anyone reading this post has other ideas I would love to hear them. Freshwater sponge on steel anchor cables in Powell Lake, BC. Freshwater Sponge (Spongilla lacutris) looks like a plant because of it's green branched structure, but it is a member of Phylum Porifera that includes fresh and salt water sponges. Sponges are part of the animal kingdom. While they may be capable of some movement, they are essentially stationary. Water flowing through sponges provides them with and food, and carries away waste. Inside specialized cells with flagella (whip like appendages) keep water flowing. Sponges control the amount of water flowing by opening and constricting small pore openings. Sponges feed on bacteria, small bits of organic matter, and algae. Freshwater Spongilla sponges reproduce asexually by forming buds (gemmules) prior to winter and these develop into adults in the spring. They also reproduce sexually in the summer with larvae moving about freely using cilia to reach their new habitat. They can be found in clean lake waters and slow flowing streams. References: Pioneer Union Elementary School District Virtual Zoo (online), A Snail's Odyssey: a journey through the research done on west-coast marine invertebrates (online), and The Phylum Porifera Project (online). Soup is a quick, comforting, and easy food to prepare at the cabin. When all the contents are on hand in the fridge and pantry, it's doubly easy. Here's my take on Tortilla Soup. The key ingredient is a crispy corn tortilla strip topping. Fry the strips in a small amount of oil and keep them warm in the oven while the soup cooks. Bring water to a boil and add bullion packages. Dice onions, garlic, tomatoes, and meat and add to the soup mixture. Drain and add half a can of hominy (freeze the rest for later). Add a bay leaf (remove before serving) and season to taste with chili flakes, cumin, and Lemon Pepper. Allow the soup to simmer for half an hour until the ingredients are soft and the flavours marry. 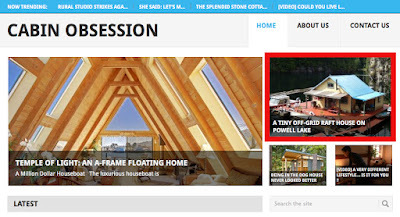 Our Float Cabin Highlighted on "Cabin Obsession"
We love our float cabin home and enjoy sharing information about off the grid living. 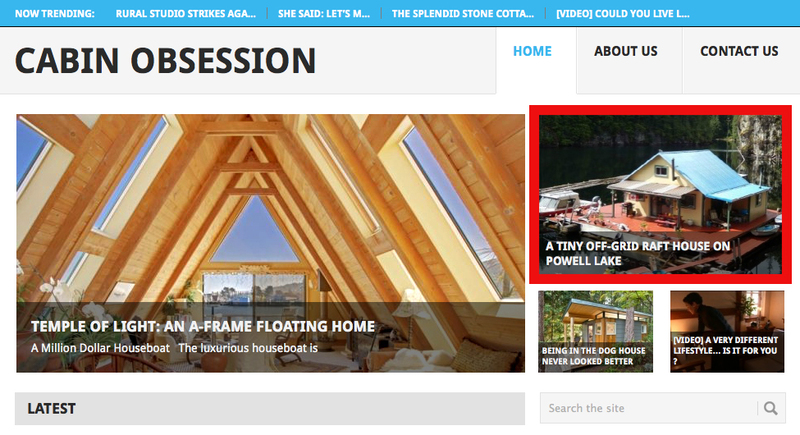 We are pleased to announce that our float cabin home was highlighted on the Cabin Obsession website and Facebook page. At the end of the story there are links to YouTube videos I made about our float cabin home. Click below to see them for yourself. Leftover cream frozen in the container on the right. I love half and half (or 18% coffee cream) in my coffee each morning. Sometimes I end up with extra. I researched online and every site said the butterfat in half and half would separate during freezing, making it undesirable for use in coffee. I hate to waste, so I started to experiment. I learned to mix the half and half with some milk (we use 1%) before freezing and it helped reduce the separation, but it wasn't perfect. Separated butterfat shows on the sides of the container. Then one evening I used thawed half and half in hot cocoa. I discovered that the lumps disappeared. So the next time I froze my half and half and milk mixture, I heated it after thawing. Heating and whisking the thawed half and half did the trick. I put the thawed half and half and milk mixture in a saucepan, brought it to a gentle boil, and held it there for two minutes. I whisked it vigorously during the heating process. I let the half and half cool and then put it in a container to return to the refrigerator. The results were better than expected, no more lumps of butterfat rising to the top of my coffee cup. Deer Fern (Blechnum spicant) is a bright green medium sized evergreen fern that is common in Coastal British Columbia. It grows in wet forests, slide areas, stream banks, and in association with alders from low elevations to sub-alpine heights. There are two types of leaves. Sterile leaves (lacking spore sacs) surround the base, mostly touching the ground. Fertile leaves, containing the spore sacs clustered in structures called sori, bright green and stand upright. It was the bright green colour of the Deer Fern that caught my eye in the shaded road cut next to a stream on Cypress Main near the Head of Powell Lake.